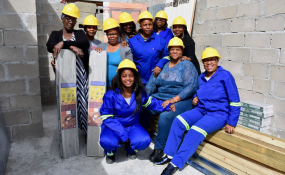 Cape Town women from Philippi, Crossroads, Khayelitsha and Strand have started a stokvel for building homes: Dorah Mkenku, Nolthando Mrwebi, Magotso Malgas, Hazel Ndzawuse, Andiswa Fana, Asiphe George, Caroline Moto, Ntosh Plati, Lizzy Scwebu. "We can't keep on having stokvel for food when we know that the most important thing is the roof over our heads," says Ntombekhaya Plati. "We get a quotation and go to the hardware store to buy material or save the money to buy a house or a plot," she says. "I am tired of staying in a shack that leaks when it rains. I want to sleep peacefully when it's raining," says Dorah Mkenku. "I have been doing stokvel for food for more than 15 years and I have nothing to show, but this will have good results because in no time my house will be done." The members of the group have chosen a uniform of overalls and work boots to wear to their monthly meeting. Lizzy Sicwebu says, "We didn't want to wear high heels."